Create some fun, holiday memories with friends and family by creating some awesome holiday crafts with pool noodles! You might be surprised how great these ideas are! Shop our SwimWays Standard Swim Noodles on Amazon and Target, and our Super Swim Noodles on Target! Want a cute, inexpensive holiday yard decoration? 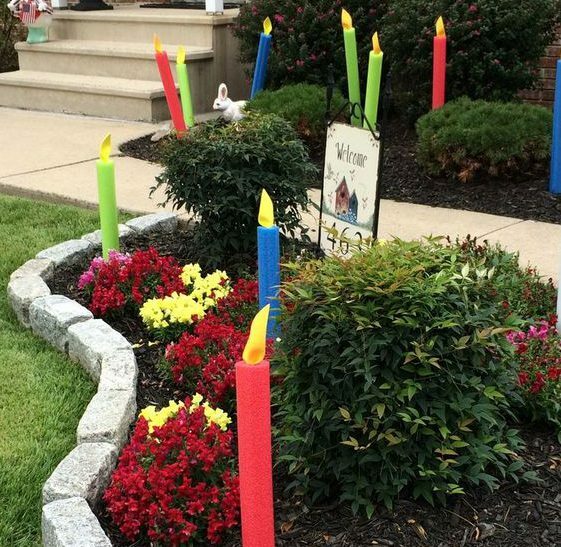 Enjoy making these pool noodle candles with your kids this holiday season! It’s simple to make and will make your yard that much more festive. Just cut the pool noodles to the size you’d like, cut out flame shapes from foam sheets and bend them accordingly. Glue the flame on top of the noodle and stick a landscape stake through the other side. Then stick the stake into the ground. 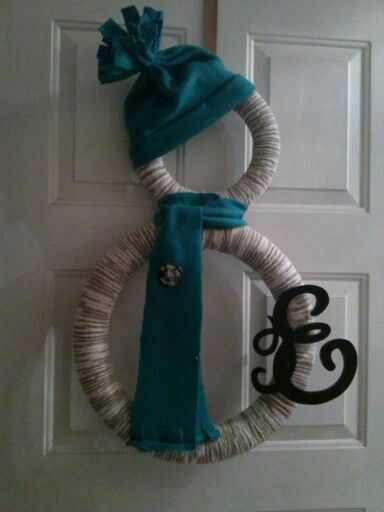 Make your door stand out with this unique wreath that stays relevant ALL winter long! Find an old matching hat and scarf set you’ve got lying around and sew a button or pin a broach to the scarf- then set them aside until later. Cut two pool noodles to the sizes you need and bend them into 2 circles. Glue the ends together. Wrap your choice of white yarn or ribbon around the noodles using glue sparingly along the way to keep it in place. Then, glue the smaller circle on top of the larger one to replicate a snowman head and body. Cut out your family’s monogram from a foam sheet or take the lightweight one you purchased and glue it to the body of the snowman. Lastly, glue the hat and scarf on the snowman and hang it up! This one’s for those of you who are really into crafting! 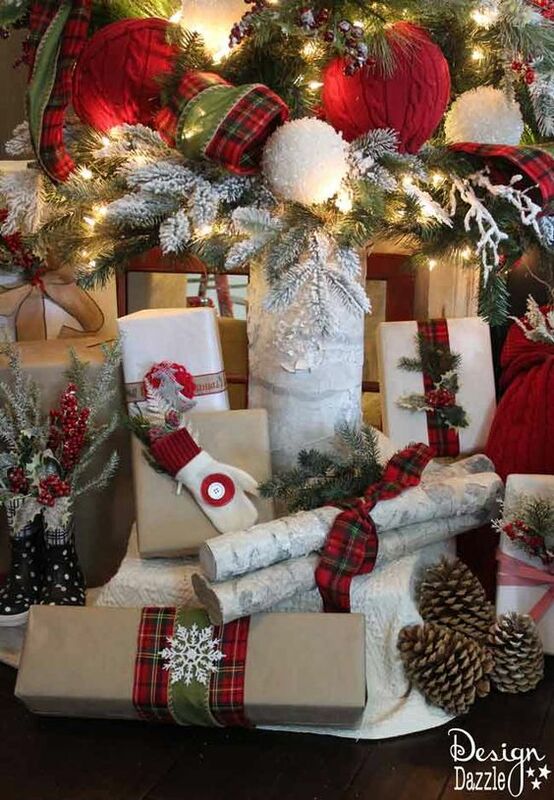 Take a look at the details on making these adorable, decorative logs here! It may take longer than some of these other crafts, but it may also be worth it! If you aren’t looking for anything too time consuming or extensive, this craft is the way to go! Get some of our red pool noodles stick some wire inside and bend the noodle in the shape of a candy cane. Then, wrap some white masking tape around the noodle so that it gets evenly distributed. Here’s another simple but cute holiday craft/decoration! 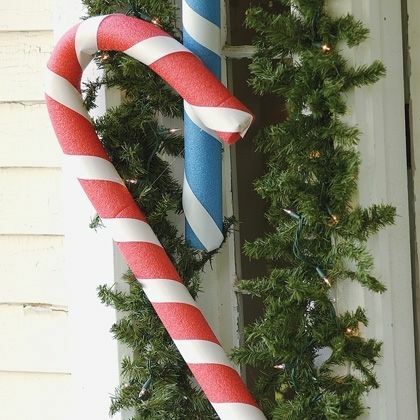 Cut 1-2 pool noodles (depending on the height you are looking for) and slip some candy cane striped tights or socks over them. Place one end inside some elf shoes and slip an elf hat on top! If it needs some extra help to stay standing, you can stick something inside the shoes to keep it weighted down and glue or tape it to the noodles. So easy!